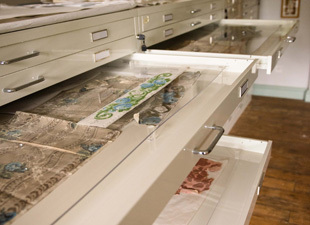 Historic wallpaper printer and expert David Skinner has electronically catalogued the collection of over 250 samples. The papers come from all around Ireland – from farmhouses to castles. Detailed is a fragment from an early 19th-century damask flock from the largely 17th century Turvey House, Donabate, County Dublin, which was demolished in 1987. Some pieces of paper in the collection have been framed, as they were loaned to Dublin Civic Trust for an exhibition it held in 2003, with accompanying catalogue. The Trust is delighted to be able to fulfil the donor’s wishes in sharing the collection for scholarly research and looks forward to engaging new international audiences.